The panel helped students understand the realities and skills needed for finding a job in international organizations. 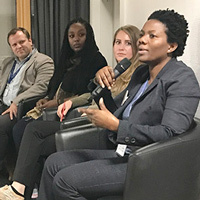 More than 70 students, alumni and faculty gathered at Webster Geneva for a career services panel discussion on the skills needed to land jobs in international relations and the realities of working in the field. The panel moderated by Oreste Foppiani, department head for international relations at the Geneva campus, included several alumni currently working for such organizations. Among the alumni panelists were Natena Mengesha Kebede (staff welfare officer, World Intellectual Property Organization), Attila Turos lead, future of production, World Economic Forum), Sarah Knight (resettlement assistant, International Organization for Migration) and Lori Werner (program assistant, International Trade Centre). Fellow panelist Kemi Oladapo from ICVolunteers emphasized the value of volunteer work to gain experience and skills to work in the field. Read more and see more photos in this story at Webster Geneva. In addition to undergraduate international relations programs -- the BA is also available with an emphasis in migration and refugee studies or an emphasis in international economics -- Webster University academic programs at the Geneva campus also include the MA in International Nongovernmental Organizations.